Southbound, J19 is where local roads from three directions, plus through traffic on the M8, all funnel onto the Kingston Bridge across the Clyde. 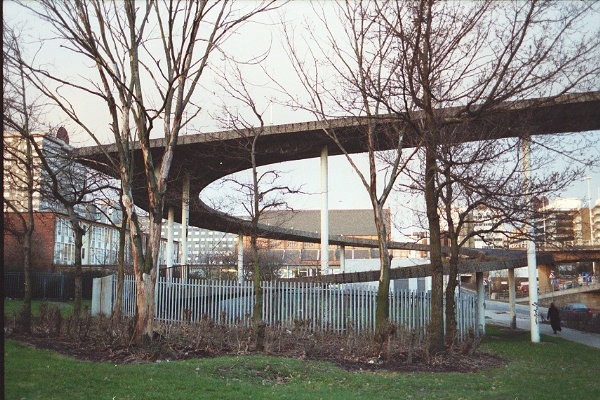 Northbound, this junction includes exits for both J19, leading to the Clydeside Expressway, and J18 for Anderston/Charing X and for the City Centre. However, the northbound motorway on the bridge is partitioned, with the two lanes which joined at J20 leaving at J19 and J18, and traffic from the mainline only able to exit towards the City Centre from J18. 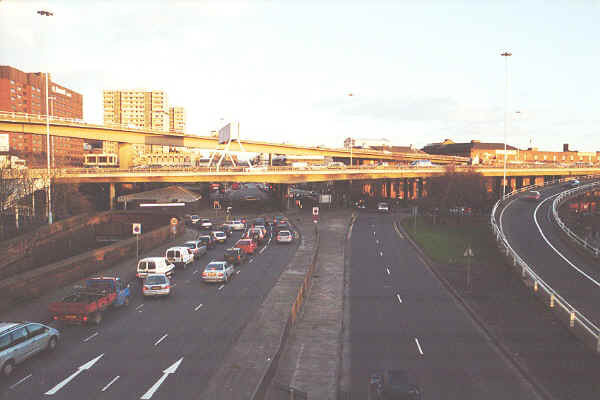 The A814 Argyle Street crosses E-W underneath the junction, leading west to the Clyde Expressway. 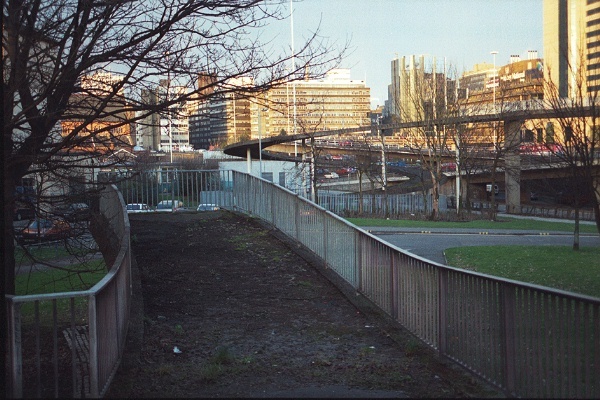 The A804 runs parallel with the motorway, directly underneath to the south of the junction and on either side to the north. 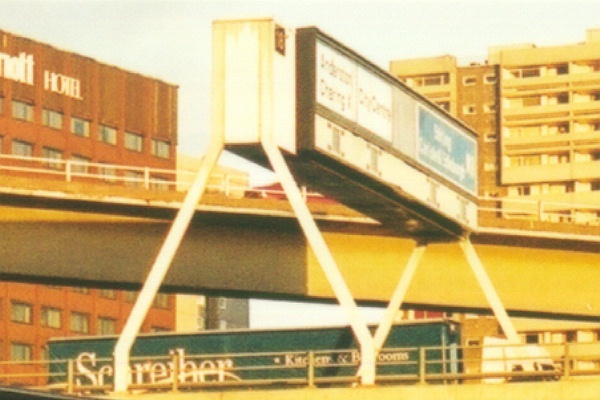 A typical gantry sign from the early phase of the M8 in Glasgow. These gantry signs are all backlit, hence the very deep box section and rigid construction. The signs themselves consist of an upper information panel with directions and a lower panel with a small matrix display for each lane. Each matrix is bracketed by pairs of amber and red lights which flash when the lane is restricted or closed. Where a lane splits, it gets two matrix panels close together, one for each direction. While most of the direction signs are standard motorway white-on-blue, the panels above lanes which exit immediately are usually black-on-white. In this case, two lanes exit - for two different destinations - and two lanes continue on the motorway. The junction number, 18, is shown in a separate black panel at the top left corner of the gantry. 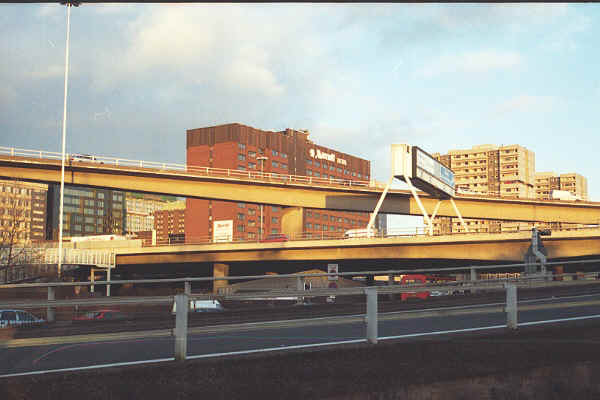 The A814 Argyle Street passes underneath the M8, with the A804 crossing on the level beneath the motorway. The ramp descending from left to right is from the eastbound A814 to the southbound M8, with the opposite flow descending from the motorway on the far right. 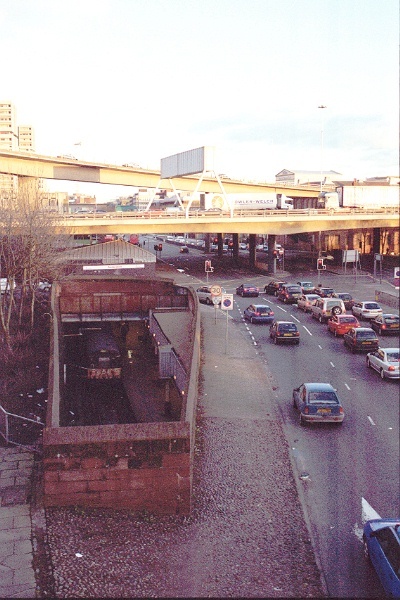 The intersection actually has a fourth level: One of Glasgow's suburban rail lines has a station directly underneath the motorway junction. This is a proper mainline railway station, with both local and long-distance services. 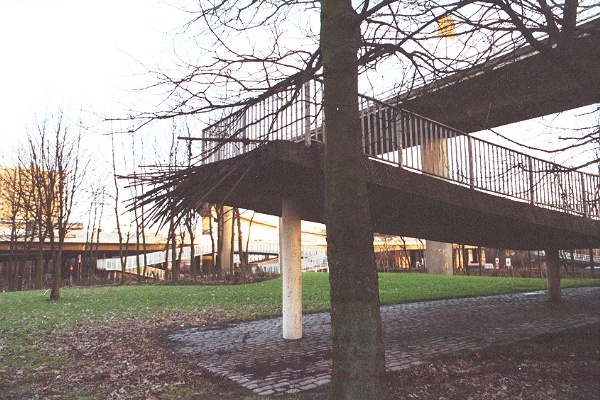 A 'bridge to nowhere'. This is the lesser known of the two surviving examples in Glasgow. The other is the spiral in the background - to which this one should have been joined. Reinforcing rods splayed out at the unfinished end of the bridge. 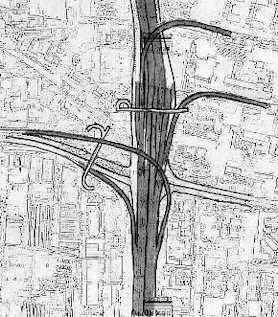 The original pedestrian bridges on the motorway all follow graceful sweeping curves. It's just a pity this one ends so abruptly. 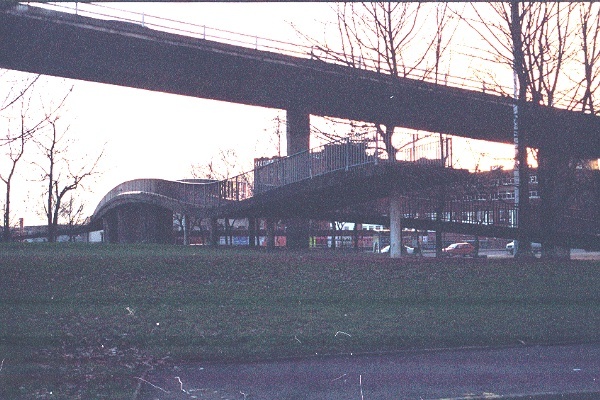 Spiral ramp of the larger 'bridge to nowhere', with a stub end where it should have been extended to the other. This end of the bridge has no guardrails at all, and the base of the spiral is protected by a high spiked fence. The other end does have guardrails, but finishes abruptly with a 60 foot drop.